A haunting novel of rivalry, love, and betrayal that transports readers back to Renaissance Italy, Leonardo's Swans will have you dashing to the works of the great painternot for clues to a mystery but to contemplate the secrets of the human heart. Isabella d'Este, daughter of the Duke of Ferrara, born into privilege and the political and artistic turbulence of Renaissance Italy, is a stunning black-eyed blonde and a precocious lover and collector of art. Worldly and ambitious, she has never envied her less attractive sister, the spirited but naïve Beatrice, until, by a quirk of fate, Beatrice is betrothed to the future Duke of Milan. Although he is more than twice their age, openly lives with his mistress, and is reputedly trying to eliminate the current duke by nefarious means, Ludovico Sforza is Isabella's match in intellect and passion for all things of beauty. Only he would allow her to fulfill her destiny: to reign over one of the world's most powerful and enlightened realms and be immortalized in oil by the genius Leonardo da Vinci. Though Isabella weds the Marquis of Mantua, a man she has loved since childhood, Beatrice's fortunes rise effortlessly through her marriage to Ludovico. The two sisters compete for supremacy in the illustrious courts of Europe, and Isabella vows that she will not rest until she wrestles back her true fate and plays temptress to the sensuous Ludovico and muse to the great Leonardo. But when Ludovico's grand plan to control Europe begins to crumble, immortality through art becomes a luxury, and the two sisters must choose between familial loyalty and survival in the treacherous political climate. Leonardo's Swans is an exceptionally vivid evocation of the artist during his years in the glittering court of Milan, re-creating the thrilling moments when he conceived The Last Supper and the Mona Lisa. It portrays a genius ahead of his time who can rarely escape the demands of his noble patrons long enough to express his own artistic vision. When Fortune comes, seize her firmly at the forelock, for I tell you, she is bald at the back. She grew up in a land of fairy tales and miracles. That is what Isabella is explaining to Francesco as they ride through Ferrara's streets. It is Christmastime, and though there is no snow on the dry stone road, the horses shoot clouds of steam into the frigid air through their nostrils. While Leonardo's Swans is written from the points of view of the Este sisters, each chapter begins with an excerpt from the actual notebooks of Leonardo da Vinci, who is a pivotal character. How did the portrayal of Leonardo change your opinion of this iconic artist? Were you aware of the breadth of his work, which included weaponry design, anatomy, sculpture, and machinery? If you enjoy historical fiction, and in particular books that focus on the lives of famous artists such as those by Susan Vreeland, Tracy Chevalier and especially Sarah Dunant, you should take a good look at Leonardo's Swans; particularly so if you have an interest in the Renaissance in general, and Leonardo da Vinci in particular. (Reviewed by BookBrowse Review Team). Essex's canvas is too finely detailed to adequately represent the epic dramas...But the stories of Isabella and Beatrice d'Este along with the occasional investigations of Leonardo's artworks, methods and personality are always engrossing. Essex delineates the confusion of historical events and historically accurate personalities with clarity, but she never quite achieves a sense of human urgency. With lush, colorful descriptions, Essex brings to life the Sforza court and the competitive d'Este sisters'complex relationships with each other, their husbands, and Leonardo. Powerful historical fiction. Karen Essex's latest novel brilliantly captures the turbulent years of late 15th-century Italy as seen through the eyes of the bold and beguiling Este sisters, whose lives and fates were inextricably woven into the political tapestry of those times. A pictorial tour of Leonardo's Swans. According to Karen Essex, Isabelle d'Este is the the naked Venus in this painting by Mantegna. Sforza's 1st mistress, Cecilia Gallerani, in a painting by Leonardo da Vinci. A painting that some think is of Sforza's 2nd mistress, Lucrezia Crivelli. Recent conjecture suggests that Isabel of Aragon was the model for Leonardo's Mona Lisa. According to art historian Maike Vogt-Luerssen, Isabel "was close to Leonardo da Vinci, the painter at her court for 11 years, and remained a friend of his, and possibly more, for most of her life." 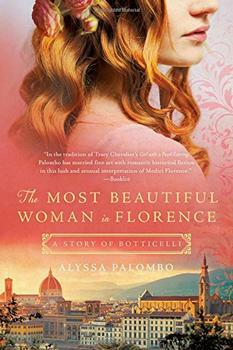 Alyssa Palombo's The Most Beautiful Woman in Florence vividly captures the dangerous allure of the artist and muse bond with candor and unforgettable passion.